First mix flour and baking powder, and add all remaining all ingredients. Then the texture of the dough should be close to a very thick crepe batter. And adjusting the quantity of water accordingly. Then stand 6 hours at room temperature. 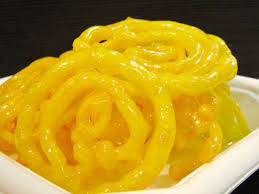 Now using plastic sauce bottle and pastry bag small tip, and fry the jalebi in a shape in hot oil. Put the water, saffron, cardamom and sugar on a heavy saucepan. Then bring to boil until the syrup begins to thicken. Remove from heat. While stirring, pour the lemon juice, rose water and honey. Then immediately return to the heat and boil again, stirring constantly. And remove the pan from the heat at the first signs of boiling. Then let cool. And finally soak the jalebi generously in this syrup.